When we moved into this house we got a room that we didn't have in our previous house, a family room. That's where we lounge around, watch t.v., and just hang out. That left the living room to be used as a more formal space, for having conversations with guests without the distraction of a television. We put the sofa we already had in the living room but found that without chairs we always had to bring the chairs in from the dining room when we had guests over. That's what started my chair hunt. I knew I wanted a blue, gray, and white living room. 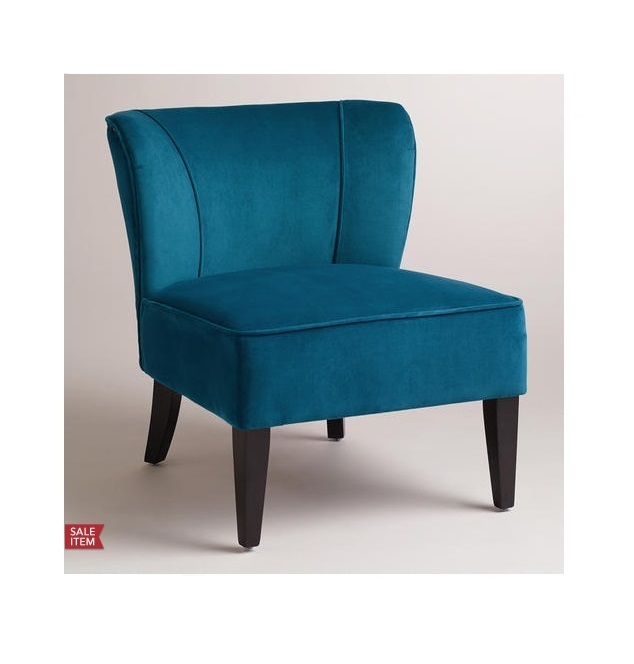 I thought a chair in some sort of blue shade would work well and I wanted to keep the budget to under $200/chair since I had to buy two. I found these possibilities online. 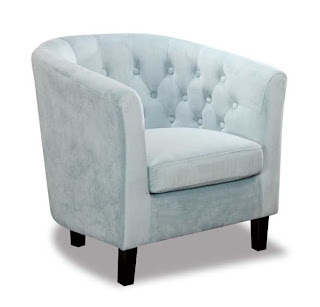 I really wanted to see them in person if possible so we went to American Furniture Warehouse to look at the Mallory Spa Velvet Tub chair. That's where my hunt started and ended. 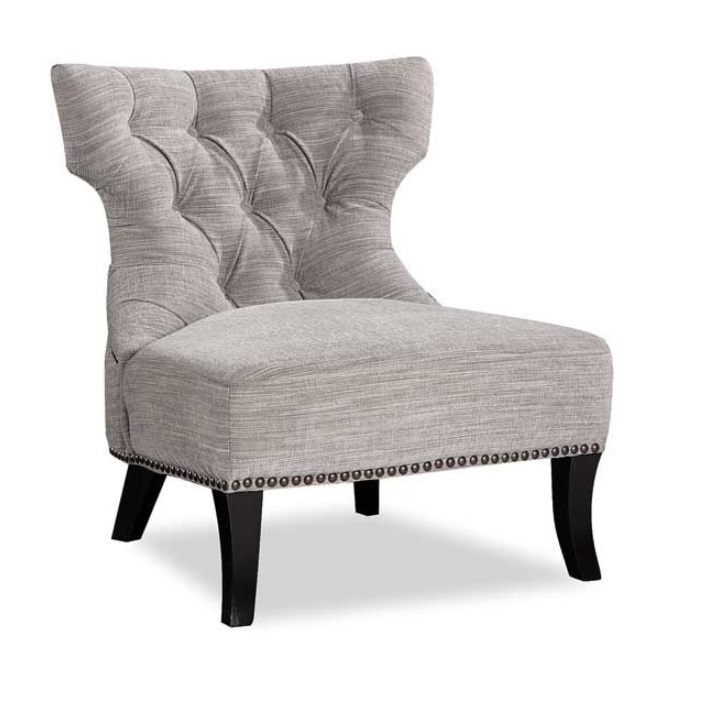 I thought the Mallory chair looked okay but it didn't take long before we found the Angie Accent Chair instead and knew it was the one. It wasn't even blue! It goes to show that sometimes no matter what your plans are, something unplanned and better can happen. We bought two of them and here they are in their new home. We still need to frame the painting that's sitting on the fireplace mantel and fill the bookshelf some more, but other than that, I really like how the living room turned out. If you are curious, here is what the living room looked like before. This is how the previous owners had the living room set up. 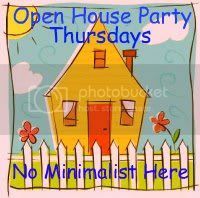 The photos were taken by their realty team and were on the MLS when the house was listed for sale. Not bad at all, but just a different style. love the new chairs Khammany, perfect for the space! I love the new chairs you picked out! Your living room is lovely! It is nice to have a room with no TV, isn't it? Hello Khammany, I like the colour scheme you have chosen very much; you even appear to have a coordinating cat! It is interesting how your new chairs seem to change colour according to the light, I really like that. Thank you for visiting my blog. It is always really good meeting new bloggers. Your living room is so beautiful, I love the colour scheme you have chosen. What a wonderful choice of chair, I would have chosen that too. The before and after photos show what a difference you have made to the room. Although the colours are lighter the room seems so much warmer. It just looks like a wonderful place to sit and relax and I see the cat seems to agree. Love your new chairs. So sculptural and stylish. I see your kitty likes it, too :) Your ceilings look so tall. How old is your house? Enjoyed my first visit, here. Whoa, what a fantastic transformation! I love the nail heads on your new chairs, they are so stylish and look great! 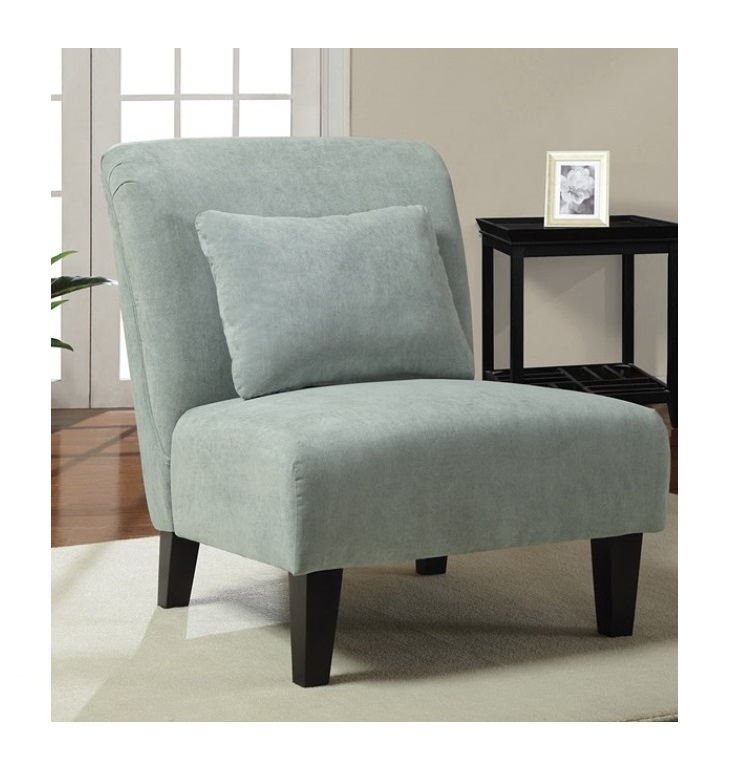 Your living room looks so pretty with your new chairs. It looks really pretty and I love all the blue aqua accents!!! Great find!!! You have a beautiful home. I love your new chairs. They look great in your living room. Thank you, Brandi! I'm so glad you dropped by! Have a great weekend! Great choice, they're just as gorgeous from the back! Your living room is beautiful! Thank you so much for visiting my blog Khammany and leaving such a nice message. What a lovely home you have, I love the two chairs you chose and your pale blue colour scheme is so restful. Like you I have a photo of my bedroom which was taken by the realtor of the previous owners look. I made over the whole room and have a link below to before and after, You might enjoy the post as I bought some old French blue shutters and used them as a headboard. It has actually been my most popular post but was one of my earlier ones. If you get a chance have a peek. I have added myself as a follower and will have a wander around your lovely blog now. The new chairs are amazing, I love the back and the cat seem to find them very comfortable! The difference with the previous owner decoration is amazing. 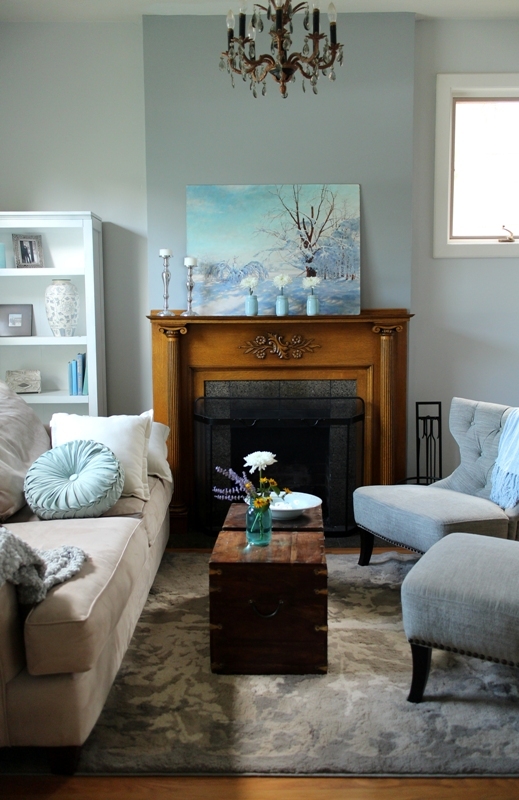 Your living-room looks so much more serene. 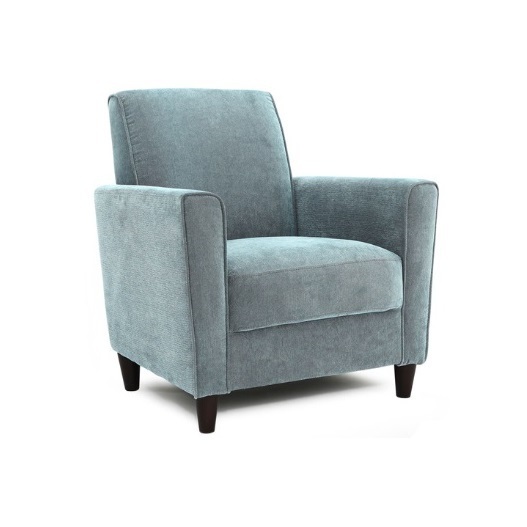 Hi Khammany, I love the chairs and they are perfect with the rug and paint color! Thanks so much for visiting and I am now a follower. Have a great week. My eyes actually widened when I scrolled down and saw the yellow room! 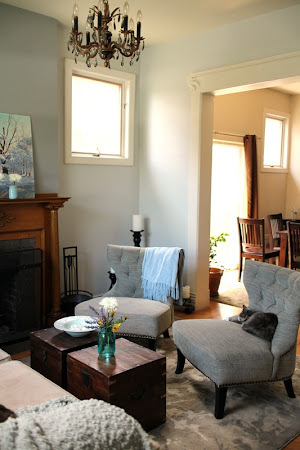 I love the new look of the living room and the chairs are the perfect match! Thanks for the recent visit and follow! I'm now your newest follower! Great choice - love the chair you picked! 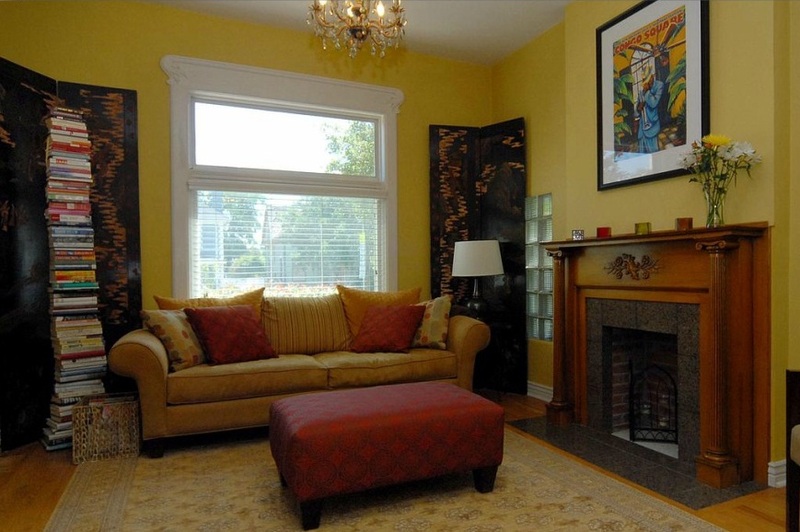 Your family room is a wonderfully cozy space and such a great fireplace!! Grey is so beautiful in there! Isn't it amazing how you go hopping to see one thing and end up finding something else? I love realtor photos for before and afters. I kept most of the realtor photos of our new place too. 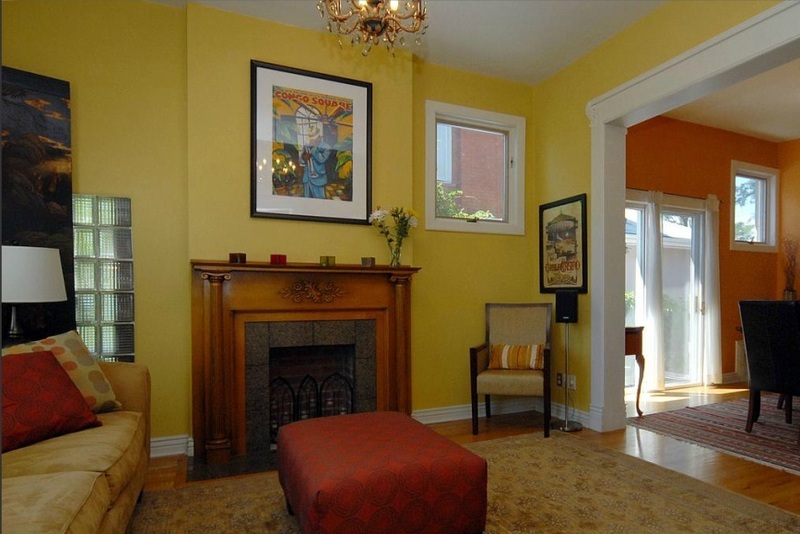 The before wasn't bad at all, but it is interesting to see what a different owner does with the same home.